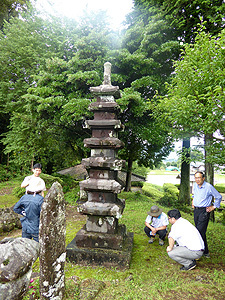 Following the concluding of a memorandum of understanding (MoU) between the Center for Conservation Science and Restoration Techniques and the Conservation Science Division, National Research Institute of Cultural Heritage, Republic of Korea, the two organizations have been collaborating on “Joint Research between Japan and Korea—Research on the Effect of Environmental Pollution on Cultural Properties and Development of Conservation Techniques.” More specifically, they have been undertaking joint field studies of cultural properties made of stone in outdoor locations in both countries, and have been holding annual research results presentation sessions, with the venue alternating between Japan and Korea, with the aim of sharing the research results achieved in each country. This year’s research results presentation was held in Japan on July 8, 2015, in the Basement Level Meeting Room of the National Research Institute for Cultural Properties, Tokyo. The theme for the presentation was issues relating to the structure of stone-built cultural properties. The Japanese and Korean researchers reported on and discussed their respective research results. In addition, taking advantage of the Korean researchers’ visit to Japan for the presentation, a study visit was arranged to examine the nine-storey stone pagoda and seven-storey stone pagoda, etc. at the Myodo-ji Temple in Yunoma Town, Kumamoto Prefecture (where the Japan-based joint field studies have been undertaken), and to exchange information regarding new developments in structural reinforcement methods.